'Day for Daniel' is a National Day of Action to raise awareness about child safety and protection. Parents, carers and guardians are asked to start a conversation about personal safety in the real world and in an online environment. 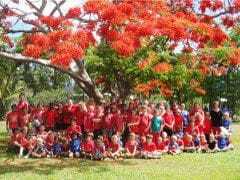 Wear Red, Educate and Donate is the theme of 'Day for Daniel' as we strive to have schools, kindergartens, businesses & community groups across Australia take action and conduct child safety activities in their local communities to help in 'Keeping Kids Safe'. 'Day for Daniel' is an opportunity for Australians to make a statement that crimes against children are not acceptable in modern Australia. It aims to help empower our children to RECOGNISE, REACT and REPORT if they feel something is not right. This donation is on behalf of Living Faith Lutheran Primary School students and staff. Donation from the students at Oberthur Primary School. On behalf of our student council. Money raised through donations from Sydney Office members on The Day for Daniel. The parents very much appreciated that we used the day to promote and teach the children ways to stay safe. Fund were raised through a sausage sizzle. 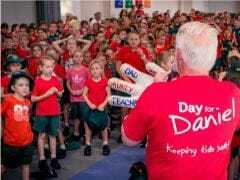 We fully support Day for Daniel and the Daniel Morcombe Foundation. Thank you for raising awareness. We continue to pray for your family. Blessings. We raised $200 on our "Day for Daniel" here at Deebing Height. Thank you so much for your visit last week. We have had wonderful stories and positive feedback from students and parents.